Google likes text, but what about your potential customers? Whether we're talking about B2B or B2C, the statics for text aren't friendly! As CEO of Chartbeat Tony Haile reported in a 2014 Time article, "We confuse what people have clicked on for what they've read. We mistake sharing for reading." This may be true of video as well, however, the stats for video are far more positive. More on this later. Let's look at the cold facts. Chartbeat found that 55% of 2 billion visitors spent less than 15 seconds on any page they clicked to. When results were filtered for people who had specifically clicked to articles, they found 1 out of every 3 visitors left the page within 15 seconds. They also found that social sharing isn't a good indicator of whether an article has been read or not. Of 10,000 articles that were shared to social sites, no relationship between sharing and increased readership appeared. Native advertising, where articles are crafted specifically for sites like the New York Times or Forbes, barely performs. "Only 24% of visitors scrolled down the page at all, compared with 71% for normal content. If they do stick around and scroll down the page, fewer than one-third of those people will read beyond the first one-third of the article," states Haile. Nielsen Norman Group (NNG) backs up this information. "We've known since our first studies of how users read on the Web that they typically don't read very much. Scanning text is an extremely common behavior for higher-literacy users; our recent eye-tracking studies further validate this finding." While NNG admits their study participants belong to a higher-than-average intelligence demographic, this tendency to skip over text is well established. 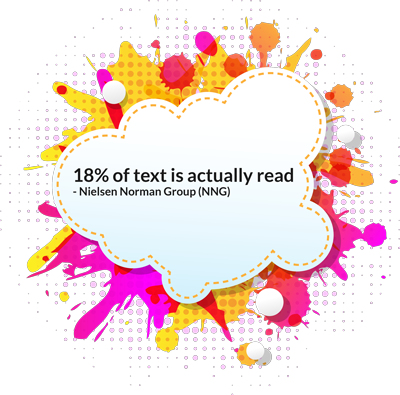 Adjusting for the higher reading speeds associated with this group, NNG concluded that 18% of text is actually read. Clearly text isn't enough. It doesn't matter if it's social marketing, email marketing, blogging or website content. These off-site SEO strategies are most effective when you embrace video. It is essential for successful marketing. Video and mobile partner extremely well. According to Hubspot, 50% of mobile traffic engages with video. Of those 50%, 65% will watch more than 75% of the video. That's a significant improvement over 18% for text! Your customers are watching video-with 78% watching video once a week and 55% watching video every day. This statistic is especially significant for the B2C market. However, there's been a major rise in video engagement among business executives over the past year. You can expect 75% of them will view a work-related video every week, and 54% will share it with a colleague the same week. Only 41% of the senior executives polled reported that they preferred text over video. This means video options are very well received in both B2B and B2C markets. One of the possible reasons for this is the proven fact that 90% of the information we process is visual. Thus video enables our brains to absorb information 60,000X faster than it does when we're reading text. Video and email marketing also display a complementary partnership. Insert 'video' in your email's subject line to boost open rates by 19%. Increase "click-through rates by 65%." Reduce "unsubscribes by 26%." Implix reports even higher click-through rates for introductory emails with video included-96%. Video and search engine marketing collaborate extremely well. Forrester Research found that video made it 50% easier to make page 1 in Google search results. Marketing Serpa claims you may attract from 2 to 3 times more visitors each month and increase your organic traffic by 157% by adding video to your website. So even though Google likes text as a tool for understanding what your site is all about, it rewards you for having video, because it knows your visitors love it. Video enhances decision making. Whether you are communicating information with a B2B focus or B2C, video can play a role in closing the deal. Invodo reports that video plays a role in choosing products for 52% of online consumers. 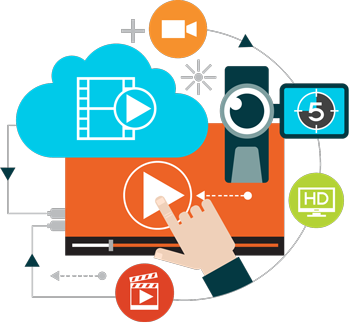 Video is the best way to engage your present and future customers. While text will always play a role in marketing, you'll see more ROI if you use it to complement a video marketing plan. We suggest you get started by downloading our Simple Video Blogging Guide below.